As a nascent village, Oneota hugged the shoreline of St. Louis Bay near the mouth of Keene’s Creek, dominated by a few pioneer families whose names are oft-remembered for their contributions. This community’s first cemetery was located on the swampy bank close to today’s 45th Avenue West. On the original plat, the graveyard is shown along with the schoolhouse and the homesteads and businesses of the Merritts, Wheelers and Elys. 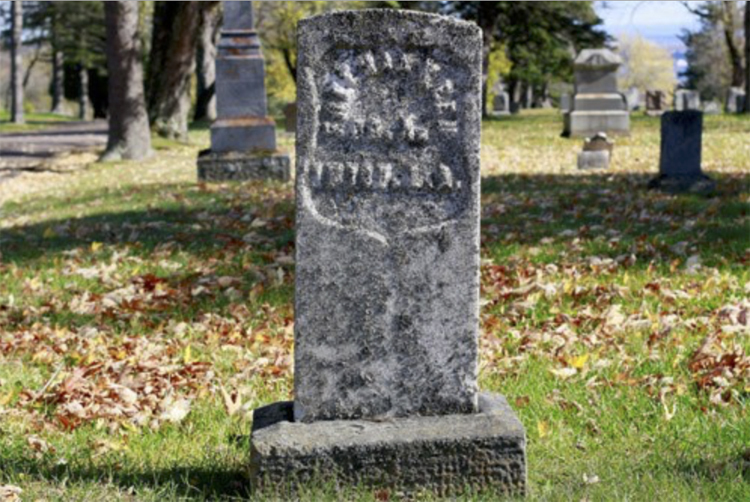 Two-year old Charles “Robbie” Peet—buried in December 1859 after a six-day struggle with scarlet fever—was Oneota’s first recorded burial in that swampy graveyard. He was the son of Reverend James Peet, Oneota’s first resident Methodist minister. According to Manley P. Burns, Robbie Peet’s father was so cash poor around the time of his son’s death that he had huge holes in his boots, big enough to pass his hand through, and was unable to buy new ones. His salary guaranteed only a house rental and vegetables. According to Etta Wheeler Merritt, Peet’s burial in what proved to be unstable ground was the turning point for how Oneota residents would handle its dead. It was rightly determined that a swamp was not an ideal location for a cemetery. So young Robbie Peet was disinterred and moved to a new graveyard at 44th Avenue West and 1st Street, next to Oneota’s first Methodist Church, which later became known as the Merritt Memorial Methodist Church in honor of its long-serving pastor, Lucien Merritt. In 1885, Henry Wheeler donated land to create the present-day Oneota Cemetery up on Highland Street. Once the cemetery was platted and surveyed, plot advertisements began appearing in the Duluth Herald in October 1888. Interested parties could purchase an afterlife residence from Freeman Keen, chairman of Oneota Cemetery’s Board of Supervisors, or from the treasurer, A.F. Swanstrom. Skyline Boulevard was connected to the cemetery in 1908, temporarily creating the parkway’s new terminus, until it was extended on to Fairmount Park a few years later. 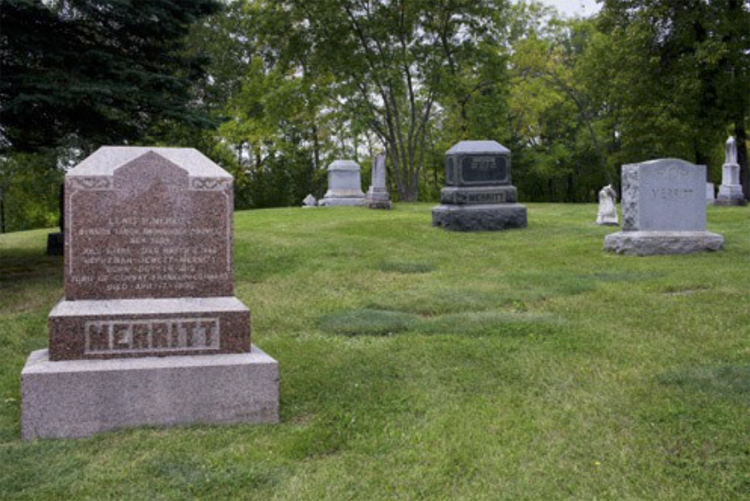 Many functional improvements were made to Oneota Cemetery in 1915, including a cage wire fence punctuated with wooden painted posts, beautification of the grounds, and renovation of the old stone vault. A turnstile was installed for a western entrance, and drainage issues that caused graves to fill with water in the central part of the cemetery were solved. A new home for the cemetery’s sexton, Walter H. Plows, was also built. 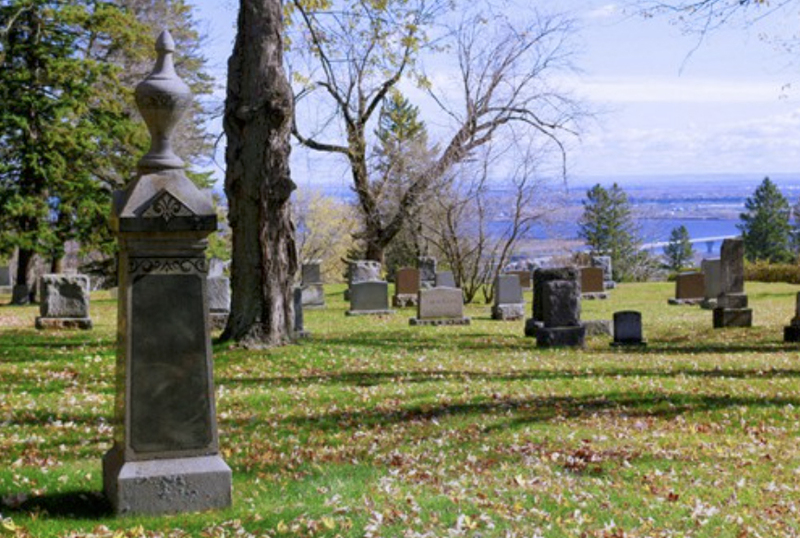 Many of Duluth’s earliest Oneota pioneers are buried up on the hill, in the northwest quadrant of the cemetery. 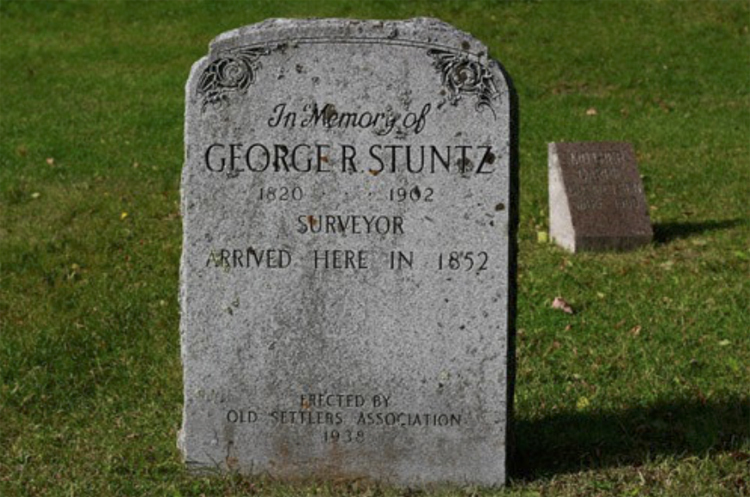 Here one may find the grave of surveyor George R. Stuntz, whose work surveying what is now mining country helped make the Northwest’s millionaires rich. Stuntz’s grave remained unmarked for almost 36 years until the Old Settlers’ Association took on the task in 1938. The man who built the Vermilion Road is buried in Plot 191, Block 3, Section L.
Just up the rise from Stuntz is the gravestone of Lewis and Hepzibah Merritt. Lewis Merritt came to the Head of the Lakes in 1855 with his son Napolean—soon followed by wife Hepzibah and the rest of their children. Several of their sons would go on to open up the Mesabi Iron Range to mining and speculation. Hepzibah served as Duluth’s earliest known midwife of non-Native descent. She died in 1906 at age 93, and according to her obituary was healthy up until a week before her death, when she was struck by “a cold that developed into grip.” At the time, she had forty grandchildren, forty great-grandchildren and two great-great-grandchildren. Nearby lies Edwin H. Hall, whose early Oneota homestead also appears on the first plat maps. Hall walked to Duluth in January of 1855 in the company of Dr. William Mayo, a journey that took six days on snowshoes. Hall ran the Oneota townsite store after he arrived, keeping books, dispensing blankets, canned goods, ammunition, and guns in exchange for furs. Later, he was secretary for the Merritts’ mining companies. Hall’s father was the first mayor of Brooklyn, New York, and Hall went on to participate in local politics as well, serving several years as a Duluth alderman and school board member. His name can be found inscribed along with other contemporary school board members on Old Central High School’s vestibule slab. A few feet away from Edwin Hall is the gravestone of one of Duluth’s Great War casualties, Theodore George Hall. By the time he died at eighteen years old, Hall had already served over a year on the Mexican border with the Minnesota National Guard. After his return, he promptly enlisted for war service, and was present at most of the major offensives in 1918, including Chateau Thierry, Verdun, St. Michel, and the Argonne. He then served in the post-war Occupation and the march to the Rhine. After only one day of illness, he died in the Spanish Flu Epidemic in Germany on December 31, 1918. He was originally buried in Germany, but his body was brought home and buried with military honors in Oneota Cemetery in 1920. Civil War veteran Freeman Keen is buried in section J, under a nearly unreadable military gravestone. Keen is the namesake of Keene’s Creek, along which he built one of Oneota’s earliest homesteads. Keen died in 1902 after being struck by a West Duluth streetcar. A few feet away is the grave of Joseph Twaddle, a Department of Natural Resources officer who was killed in the line of duty on April 25, 1930. He died when he was struck by a train near Cotton, Minnesota. Charles Gasper rests in the same section, his stone clearly noting that he once served as mayor of Duluth’s annexed village of Fond du Lac. Gasper emigrated from Germany in 1879 and after settling in Fond du Lac became its primary booster, serving as its postmaster. He also owned and operated a general store, living upstairs as a confirmed bachelor. The store burned down to the ground in January of 1899, possibly as a result of a defective chimney. At the time, Fond du Lac had no firefighting capability, and Gasper had to watch helplessly as he lost everything. He rebuilt his store a few years later. Up until his death, he was a tireless advocate for his neighborhood, and was known to ride his bicycle from his home to downtown Duluth, checking up on road conditions. For a time in the early part of the twentieth century, Third Street (Highway 23) in Fond du Lac was named Gasper Street, reflecting Gasper’s efforts to improve that road. 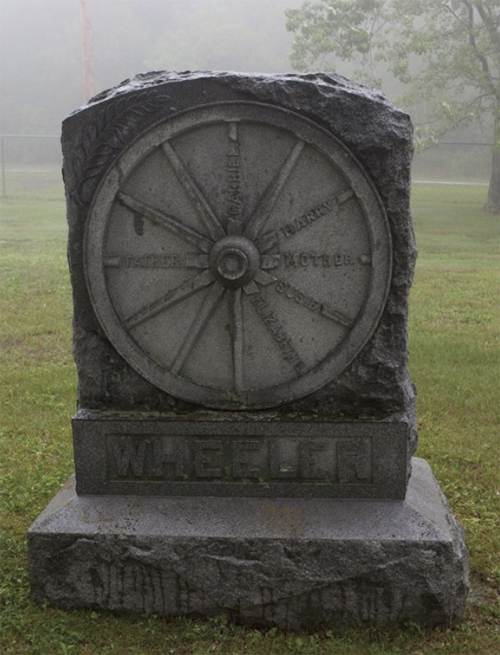 Across the cemetery lane in Section A can be found the Wheelers’ distinctive family gravestone, decorated with a large cart wheel. Henry and Sarah Wheeler and their descendants are buried around this monument. Wheeler’s sawmill was the first one built at the Head of the Lakes, near 45th Avenue West, and Wheeler Field lies on part of the land they once owned. Nearby in Section D, one can find the unassuming gravestone of Haldora Olson and her husband. An Icelandic immigrant and Duluth’s most celebrated midwife before her death in 1921, Olson worked to bring midwifery into the modern era and operated a popular West Duluth maternity hospital. 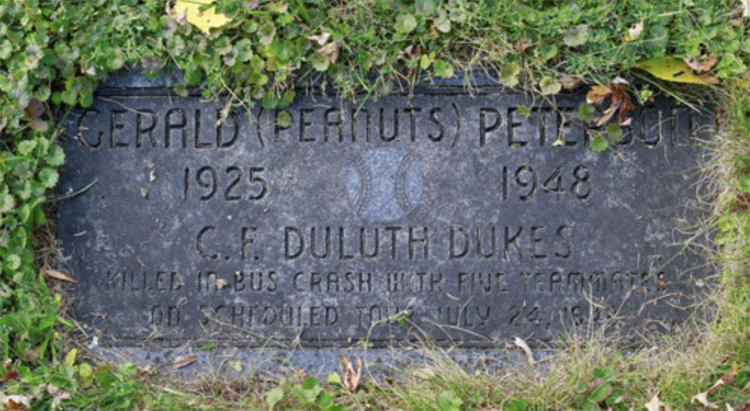 This section of the cemetery also holds the grave of Gerald “Peanuts” Peterson, Peterson was one of the five members of the Duluth Dukes baseball team killed in a tragic bus accident on July 24, 1948. A Proctor native, Peterson was a very popular player, and his gravestone is decorated by a carved baseball. Two locally prominent politicians also are buried in Oneota Cemetery. 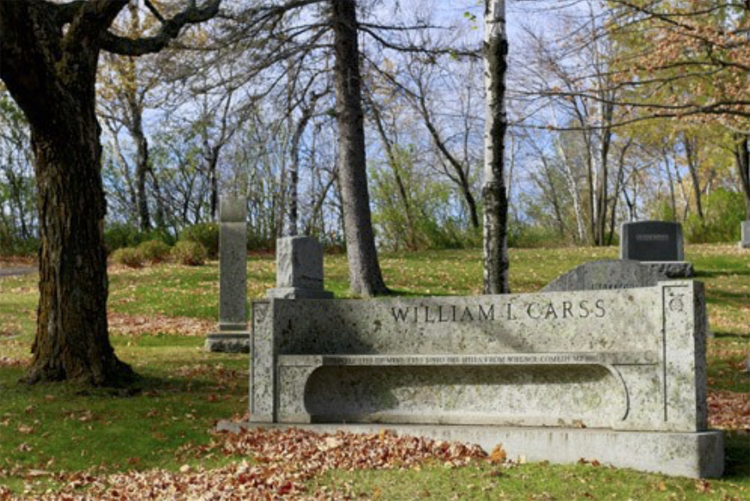 In Section E, one can find the large bench-style stone of William L. Carss, who was a United States Representative from 1919–1921 and again from 1925–1929. Carss, who died in 1931, was a member of the Farmer-Labor Party and worked before and after his stint in politics as a locomotive engineer. He was characterized as a “radical” supporter of labor causes by the more conservative press, who were at the time obsessed with the Red Scare. In Section O, one can find the grave of Minnesota State representative Willard “Mr. Environment” Munger, who served longer in the Minnesota House than anyone else in the state’s history. 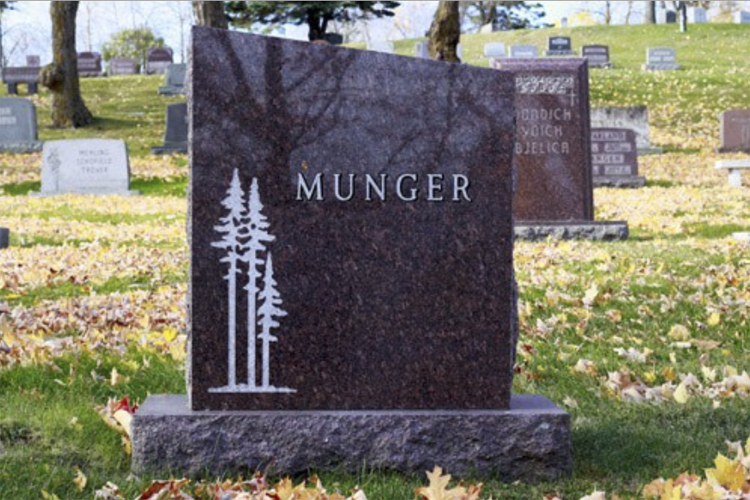 The family’s understated and modern black gravestone is decorated with three carved pine trees.